The name of this street comes from an old sign depicting a magpie quenching its thirst at a winepress, accompanied by the words “A la pie qui boit” (“The Drinking Magpie Inn”). It referred to an inn located in what is now Rue Thévenard, which once bore this name. The current street was almost completely rebuilt and redesigned after World War II. It only retains three small old houses in the north-west part of it, which connects to the Placître. 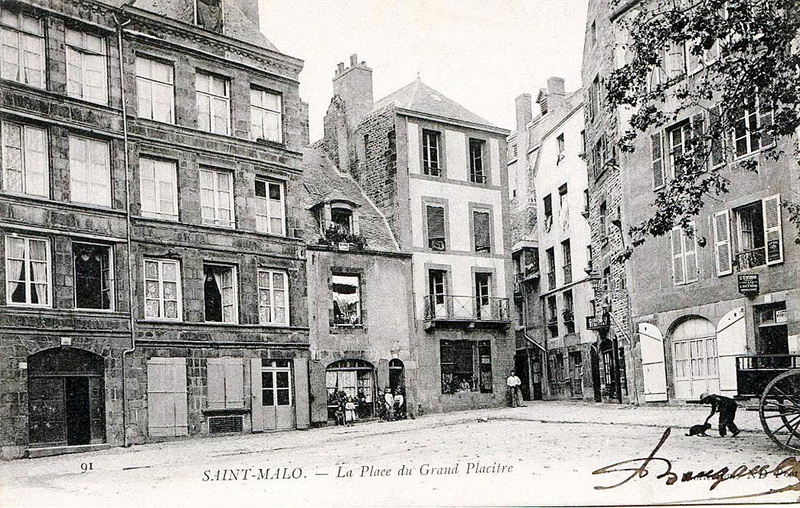 The word “placître”, which usually refers to a block of land with fencing around a church, only seems to have been a simple public square in the case of the confined spaces of Saint-Malo. Placître Bourget and Placître Cornillet, which were mentioned from the late 15th century onwards, were called the Petit Placître and the Grand Placître. The latter was used temporarily as a marketplace after the city fire that occurred in 1661. The current Placître is flanked on its northern side by the Rue Vincent de Gournay. Jacques Vincent de Gournay (Saint-Malo 1712 - Paris 1759) was an economist who is famous for his maxim: “Laisser faire, laisser passer”. This street has houses along it at Nos. 9, 11 and 13 which were rebuilt after the second Anglo-Dutch bombardment in 1695.